Spread the good news! 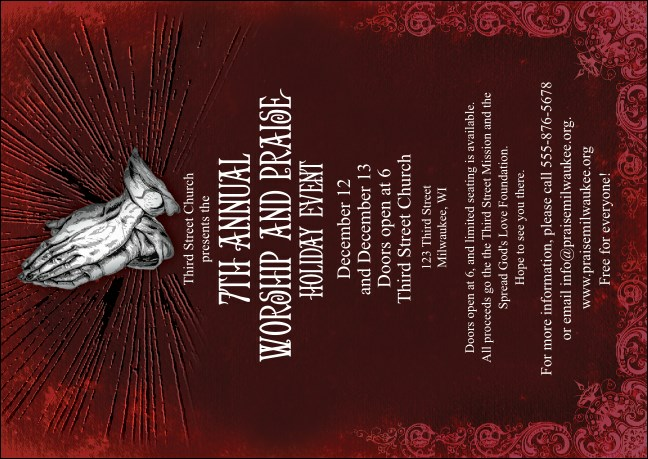 What better way to announce your event than a beautiful Gospel Postcard, in red and silver, with space to upload your own custom image to the template. Praying hands, space for all your event details, and a matching Event Kit make this postcard the ideal voice to announce your big gospel event. Not what you need? TicketPrinting.com's huge online gallery is full of great designs for any event.